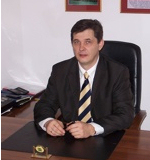 A manager with over 20 years of experience as managing director in the field of management of cultural institutions. 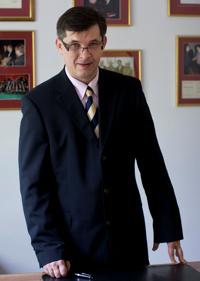 The Head of the Foundation and the "SONATA" Bogumił Łepecki Warsaw Symphony Orchestra since nearly 20 years (starting in 1989). Responsible for the organizational efforts resulting in more than 400 chamber music and symphony orchestra concerts being performed in Poland, in Europe and worldwide, including 10 international tours in Europe, the Middle East and North America, as well as in the United Kingdom, Germany (three times), France (two times), Austria, Belgium, Lithuania, Sweden, Israel, and Mexico. Prepared the Orchestra for a multitude of concerts played in the course of state celebrations, both in Poland and abroad. Organized a dozen-odd live performance recordings in cooperation with the Polish Television (TVP). In 1994, he was awarded the Silver Cross of Merit by the President of the Republic of Poland, Lech Wałęsa, the award itself being granted at the initiative of such preeminent figures in the field of culture as professor Aleksander Gieysztor , Ph.D. and professor Andrzej Stelmachowski, Ph.D. In 1998, he successfully passed the state examination for candidates for membership of supervisory boards in state-owned companies. The title and statuette of the HONORARY SONATOR, presented to His Holiness the Pope John Paul II in person by the President of the "SONATA" Bogumił Łepecki Warsaw Symphony Orchestra – Mr. Jacek Łepecki. A constituent fragment of the human soul. Having steered the Orchestra through its history together with his father since 1989, director Jacek Łepecki, the son of the Orchestra's Patron, had to carry on with his task alone from 2001 onwards, taking the helm of a time-honoured institution which rests upon the strong foundations of family traditions that spans across generations and which has, through its lasting achievements, earned its reputation as one of the pillars of national culture through the promotion thereof in Poland, in Europe and worldwide. Culture is a form of self-expression of mankind and a way in which man can reassert his very humanity. For it is man who brings culture into being, and as he does so, through this culture he creates his very own self, an act of self-inception accomplished through an inner labour of the spirit, the mind, the will and the heart. Yet he does not create it alone – he brings it to life in conjunction with others. Culture is an expression of communication between people, of common thought and common action. It is forged for the sake of the common good, becoming the fundamental commodity of the communities that comprise humankind. Culture is, first and foremost, the common heritage of the nation that creates it, and so, for example, Polish culture is the foundation upon which rests the spiritual existence of all Poles. It is this culture that sets us Poles apart as a nation and determines our actions through our history – a force more potent that any tangible powers and any political boundaries". The upcoming quarter of a century will surely bring to its listeners a wealth of memorable moments and experiences both spiritually and artistically, while the Polish national culture shall continue to benefit from the activities of an institution founded on professionalism and artistic excellence. In 2011, Mr. Jacek Łepecki was awarded the Knight's Cross of Polonia Restituta by the President of the Republic of Poland, Bronisław Komorowski, at the request of the Chapter of the Order of Polonia Restituta, for exceptional merit in the promotion and dissemination of musical culture and for his services to the veteran community.